Last time we were talking about how generous the modern belt makers are with their metal – something that is a readily available and cheap resource today. 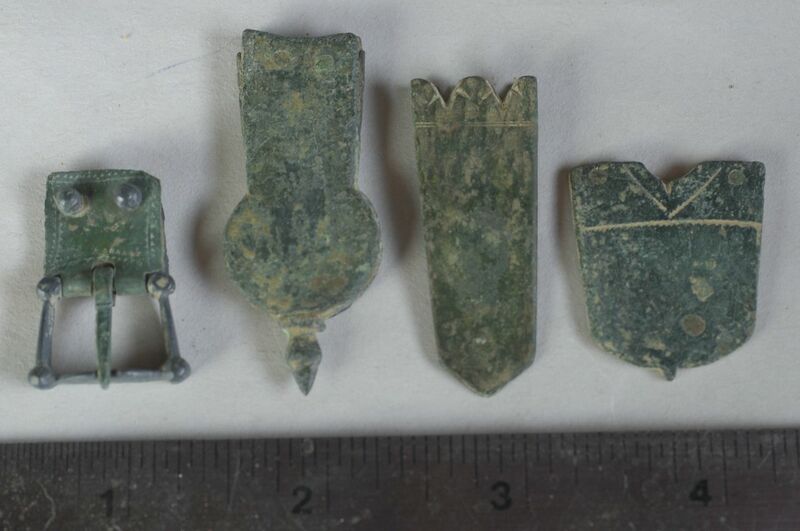 Comparing the belt fittings that we purchased at Pennsic to actual artifacts was very revealing. The first thing that I noticed was how thick and heavy the new metal pieces were in comparison to the actual artifacts. The thickness of the Pennsic purchased mounts on my belt was almost 1/16 of an inch, which was comparable to the pre-1600s mounts, but the mounts on my husband’s belt were a full 1/8 of an inch thick. The majority of the actual period mounts that I own are only about 1/16 of an inch thick. They often have hollowed out backs to reduce the amount of metal that is needed to make the piece, while making the piece look large. Looking at the buckles, my buckle was 3/16 of an inch thick. My husband’s buckle was 1/4 inch thick at the end of the plate that is riveted to the belt, and 3/16 of an inch thick where it wraps around the cast part of the buckle. But what did the real pre-1600 buckles and belt ends look like? Well, here are a few examples. You will notice that the form of the belt end immediately to the right of the buckle is virtually identical to the form of my husband’s belt end. These belt ends and the buckle look very much like the pieces that we bought, a tad smaller, but in the same ballpark, until we look at the construction techniques and the thickness and weight of the metal. And here is a side view of the actual artifacts. The artifacts are all laid against the sides of a large charcoal pencil. Looking at each one in turn, the buckle is in the lower left hand position. You can see that the cast part of the buckle is held in place by a folded piece of sheet metal, just like my husband’s buckle. The biggest difference? The thickness of the metal – my husband’s buckle is made with metal sheet that is almost 1/16 of an inch thick, while the period artifact is less than 1/32 of an inch thick, even allowing for the fact that my husband’s buckle is larger, the modern metal sheet is definitely quite beefy. One of the fun things about having intact rivets on this sort of buckle is that you can tell how thick the end of the leather belt was where it fit into the buckle. My husband’s leather belt is 3/16’s of an inch thick, and the pre-1600’s leather belt would have been 1/16 of an inch thick. The belt end that looks like my husband’s is in the lower right position. You can see that it is not a solid cast piece. It is actually a sandwich of three pieces of metal, two outside pieces of thin sheet (each about 1/32 of an inch thick and a center cast piece of metal that is 1/16th of an inch thick. This makes the entire piece 1/8th of an inch thick, and it weighs, with the rivets still in place, .4 ounces. The leather belt would have been just about 1/16 of an inch thick. The two top belt ends are both made from two single sheets of metal, riveted together. The upper right belt end has the thickest metal sheet – 1/16 of an inch thick, and the leather looks as if it would have been 1/16th of an inch thick. The upper left belt end was made with much thinner metal, only about 1/32 of an inch thick and the leather would have been 1/16th of an inch thick. But what does all of this mean? Well we will talk about the possibilities next time! This entry was posted in Buckles, Dress Accessories, Jewelry, Metal Casting, Metal Working, SCA Life and tagged Belt (clothing), Medieval belt buckle, Medieval belt end, Medieval buckles, Medieval dress accessories, Rivet by Eirny. Bookmark the permalink.